We are pleased to share with you our Fiscal Year 2018 Annual Report. We had another busy year in Fiscal Year 2018. 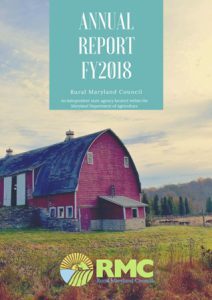 The Rural Maryland Council hosted the national conference for Partners for Rural America (PRA) in September. The conference was attended by State Rural Development Council staff and directors and included tours of economic development projects on the Eastern Shore, and visits with Congressional Representatives in Washington, D.C. Read more here….